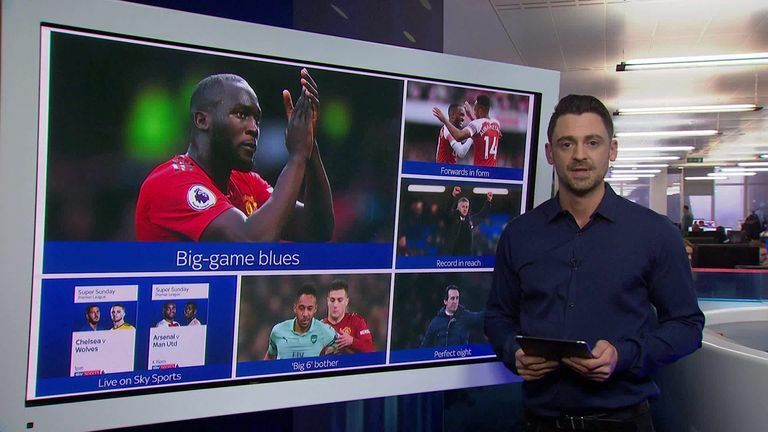 It's a blockbuster top-four tussle on Super Sunday this weekend as Arsenal host Manchester United live on Sky Sports, and we've selected five essential stats ahead of kick-off. United produced a miraculous performance at Paris Saint-Germain on Wednesday, overturning a two-goal deficit and progressing to the Champions League quarter-finals after Marcus Rashford converted a late, VAR-awarded penalty. But, with Manchester City and Liverpool running clear atop the Premier League table, the race is hotting up to secure guaranteed European qualification for next season. However, Unai Emery's side will have to improve results against big-six opponents if they are to leapfrog United on Sunday. The Gunners have the worst recent record in such games, winning just five of 29 outings since August 2016. There is hope for Arsenal, though. All five of those wins and 20 of the 24 points won in that time have come at the Emirates. Their opponents on Sunday also have the worst record in big-six head-to-heads this season, winning just one of their seven encounters so far. Emery's men average 2.5 points per game at home this term, compared with just 1.4 on the road. Only Manchester City have won more home points this season. Arsenal are now unbeaten in 14 Premier League games at the Emirates, and have won their last eight in a row - a run that began with their 4-2 win in the North London derby in December. They last won nine successive games within the same season back in 2014/15. Something will have to give on Sunday, though. Arsenal's prowess on home soil comes up against a United side that are yet to drop a point on the road under Ole Gunnar Solskjaer, winning all six games to date. Another win on Sunday and it would equal United's best-ever run of away league wins, and would also make it the first time they have achieved the feat within a single season. Having been part of the side that went close to making it seven on two occasions during his time as a player, can Solskjaer make it third-time lucky this weekend as manager of United? Neither side have had any problems finding the back of the net in recent weeks and the forwards are likely to be key in determining the result on Sunday. Arsenal will look to the league's third-top scorer Pierre-Emerick Aubameyang and Alexandre Lacazette, with the latter aiming to become the first Gunner to score in six successive home games since the club moved to the Emirates. Meanwhile, United will hope that Romelu Lukaku can add to his eight away league goals this campaign, while Rashford goes into the game looking to score a fifth goal in six top-flight games on the road. Only Sergio Aguero, Paul Pogba and Heung-Min Son have scored more Premier League goals than these four since December 22 - but nobody in the league can match Lukaku's goal ratio of 85 minutes per goal in that time. His six goals have come despite just 28 touches in the opposition box, some 41 fewer than Lacazette in the same period and even three fewer than Brighton defender Shane Duffy - who has played in the same number of games. Lukaku has scored 28 goals in 60 Premier League appearances for United, but has only one goal in 17 against big-six clubs - scoring in a 2-1 win against former club Chelsea back in February 2018. Which forwards make your team? In contrast, Rashford has scored eight of his 26 top-flight goals against United's big-six rivals. Lukaku will undoubtedly want to improve this record on Sunday. So, it is one of the most enduring rivalries in the history of the Premier League on Super Sunday, as the race for the top four intensifies. The action gets underway as Chelsea take on Wolves at Stamford Bridge from 1pm, before heading across London to the Emirates as Arsenal and Manchester United face off from 4.15pm.